Will my room have an ocean view? On which floor will my cabin be located? These are the typical questions that arise while arranging cruise accommodations. For those traveling with Special Needs, there’s another consideration that may need to be added to the equation: how accessible is my stateroom? For Special Needs travelers, there are a number of things to consider when booking a cruise. Each unique situation dictates the appropriate level of cabin accessibility to request: Maybe you’re not typically a wheelchair user, but recently underwent surgery and will be in a wheelchair or mobility scooter for the duration of the trip. Perhaps grandma and grandpa are participating in the family vacation, and they prefer a cabin closer to the elevators to avoid the long walk down the hall. If you’re considering arranging for an accessible stateroom for your cruise, be sure to review our tips, below. Note: Please do not book an accessible stateroom unless you absolutely need one. Nobody should have to miss out on a great vacation because an accessible stateroom has been reserved by someone who doesn’t really need it. -A standard stateroom or cabin may actually fulfill your needs, depending on your specific requirements. Check with your cruise line or travel agent. As mentioned earlier, perhaps simply having a cabin closer to the elevators will be good enough. -If requesting an accessible room due to travel with a wheelchair, scooter, or power chair, consider the size of the doorways and layout of the cabin itself. Again, you may not need an accessible stateroom depending on the size of the equipment you will have. Another thing to consider is that the equipment you have at home may not work well on the ship. You may want to consider a rental designed to work well on board. -Inquire about the accessibility of the bathroom. Is it a roll in shower? Are grab bars available? Should I arrange for a shower stool? -Consider the accessibility of the closet and drawers. Can I reach my clothes hung in the closet? -Note the proximity of the cabin to the elevators. Also consider which elevator bank you will be closest to. If you enjoy the casino, then it might make sense to arrange for a room closest to the elevators which let you out near your location of choice. -Ask to view a virtual tour or photos of the desired cabin/type of room. Most are available for viewing online or in a brochure. -For those who have hearing impairments, inquire about tactile alert systems – these systems can alert travelers with a hearing impairment of knocks at the door, the phone ringing, or emergencies such as a fire. -Does the cruise line have a brochure specifically tailored to Special Needs travelers? If so, ask that they forward any helpful information. 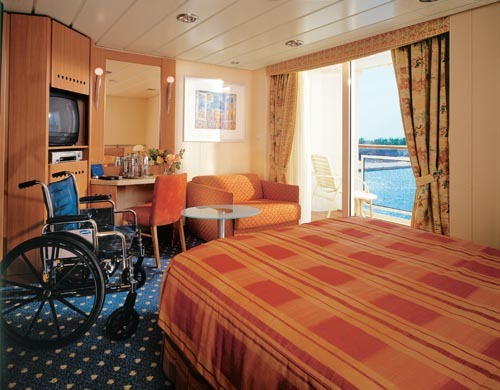 Given the tips above, if you feel it necessary to reserve an accessible stateroom, it is important to keep in mind that the number of accessible staterooms, and the degree to which these rooms are accessible, varies from ship to ship. Be sure to inform your travel agent about your specific requirements. As always, booking early is the best way to ensure that you’ll receive the most desirable accommodations. If either you or someone in your group is considering a cruise, and are interested in renting Special Needs equipment, be sure to visit us at www.specialneedsatsea.com or give us a call at 1.800.513.4515. Happy travels!